10 Gigabit Ethernet is quickly becoming the standard for business networks, driven by faster computing end-points and the proliferation of wireless mobile devices. The RN620 meets the demands of the next generation network by integrating dual 10 Gigabit Ethernet interfaces, avoiding networking bottlenecks, and 4K video multi-streaming and real-time transcoding for ultimate streaming performance. ReadyNAS® 620 is available in 6 and 8 Bay for a total storage capacity of 80TB or up to130TB with expansion module, up to 120 users, for optimized usage in high-demanding environments such as creative studios, company headquarters or large branch offices. All ReadyNAS are built on the revolutionary ReadyNAS OS 6 operating system and next-gen BTRFS file system. A best-in-class 5 levels of data protection - X-RAID, Unlimited Snapshots, Bit rot protection, real-time anti-virus and easy offsite replication work in concert to securely protect your data from common risks. All ReadyNAS systems utilize proprietary ReadyCLOUD® technology. With ReadyCLOUD, remotely accessing and sharing files in your own secure private cloud has never been easier. No VPN setup, no port forwarding, no dynamic DNS required. Featuring an architecture powered by the blazing fast quad core hyper threaded Intel Xeon server processors along with DDR4 ECC memory, the RN620 is the no compromise, high performing data storage systems of choice for businesses that need the ultimate in capacity, performance and security. 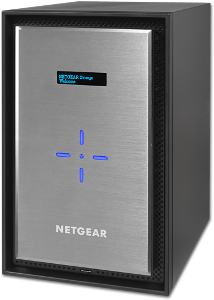 Download the NETGEAR ReadyNAS 620 Series Network Attached Storage Datasheet (PDF).